Would you like to be able to play SOLO Christmas and Holiday songs this year? 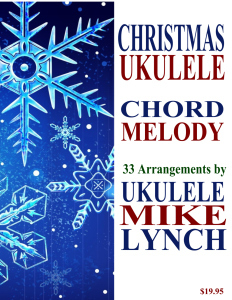 Then, Ukulele Mike’s new 33 song CHORD/MELODY CHRISTMAS COLLECTION is here for you! On your ukulele this season? Are you not so comfortable with singing? How about letting your ukulele do the singing for you? This is precisely the advantage of Chord/Melody playing. uses nothing but Chord/Melody style. No fingerpicking is required. . . Only the thumb is used. The bottom or 4th line is the string closest to your chin. ← A Christmas Gift to all . . . . Free downloadable Chord/Melody tablature for O HOLY NIGHT by Ukulele Mike Lynch . . .